A total knee replacement has become one of the most common surgical procedures in the United States, and these operations, along with total hip replacement procedures routinely rank high year after year. In most cases, having a joint replaced with an artificial one is considered an elective procedure, but it basically comes down to a quality of life issue. At some point, a patient will get tired of living with severe arthritis and opt for having the surgery. As we have seen over the past decades, that certain point in a patient’s life is being reached at a much younger age. 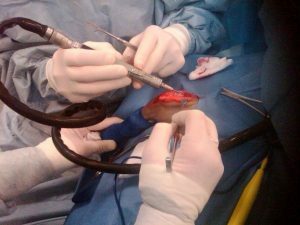 One of the reasons more and more patients are choosing to undergo the surgery each year is because more advanced techniques have been developed, and studies show that this means better outcomes for patients, shorter recovery times, and an overall increased satisfaction among patients. What makes these study results interesting is that the patient satisfaction portion is usually based on information provided by the surgeons and not the patients themselves. For that reason, a recent study from Harvard Medical School Health Publications takes a looks at how patients feel their total knee replacement operation went and how they are doing in the years that followed. However, it should be noted that no matter how well the operation goes, there is high chance of knee replacement injury if the device itself was defectively designed or defectively tested. Many of these devices should have never have been on the market, yet the companies managed to speed them through the FDA approval process, as there were similar devices on the market. This is through the use of a loophole in federal medical device legislation. It should also be noted that, in some cases, such as with the OtisKnee made by a company known as OtisMed, the device was rejected by the FDA as a result of a defectively designed cutting guide, but the company decided to ship them anyway. This decision resulted in prison time. The company is now owned by another company called Stryker, this company has its own share of problems over the years involving defectively designed artificial joints. What this particular study looked at were the patients who had undergone a total joint replacement at some point prior in their lives. This is significant number of possible research subjects since over 600,000 people undergo a total knee repayment procedure each year in the U.S. alone. There are an additional 300,000 who have a total hip replacement each year in the U.S.
One of the study results showed that while 90 percent of patients were “satisfied” with their new knees, more than 30 percent of these people said their new knee did not feel like a natural human knee. In other words, they could tell then that they had an implant, as it did not feel “normal.” About 50 percent of all patients said they still had some trouble or reduced function as compared to before they started having knee problems.